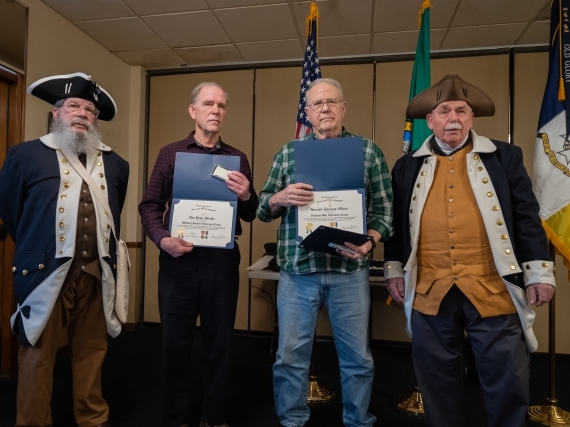 Compatriots Rex Stickle (center left) and Tom Oliver (center right) receiving their Veterans Recognition Awards from our Veterans Awards Chairman and Color Guard Captain Mike Hutchins (far right), accompanied on the far left by fellow Color Guardsman John Kraft (16 February 2019). 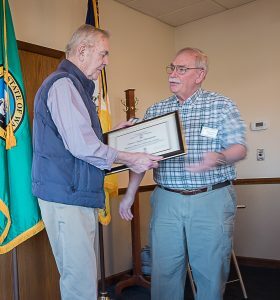 Compatriot Dr. Robert Harman (left) receiving his Veterans Award Certificate and Medal from Veterans Awards Chairman, Mick Hutchins (15 September 2018). 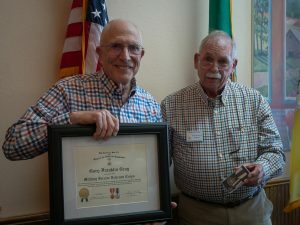 Gary Gray (left) accepting his Veterans Recognition and Medal and Certificate from Veterans Award Chairman Mike Hutchins. 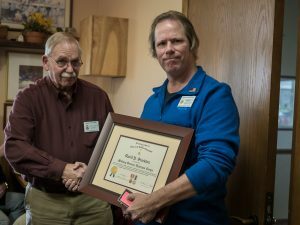 John Kraft (right) accepting his Veterans Recognition and Medal and Certificate from Veterans Award Chairman Mike Hutchins. 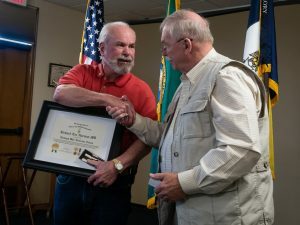 Robert McNeese-Young (left) receiving his Veterans Certificate and Medal from Veterans Awards chairman, Mike Hutchins. 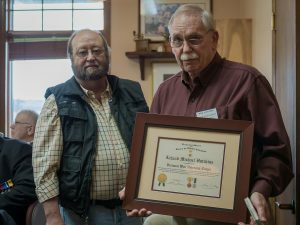 Albert John (Perk) Bingham (left) accepting his Veterans Award Certificate from our Chapter Veterans Chairman, Michael Hutchins. 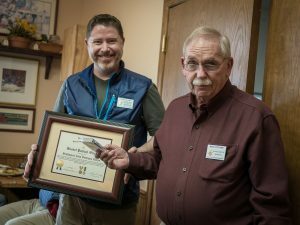 Christopher Fridley (left) presented Certificate and Medal by Veterans recognition awards chairman, Michael Hutchins (right). 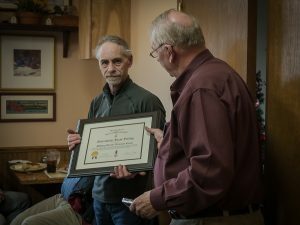 Michael Hutchins (right) presented Certificate and Medal by President Dale Harshman (left). 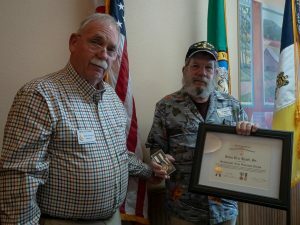 Russell Oliver (left) presented Certificate and Medal by Veterans recognition awards chairman, Michael Hutchins (right). 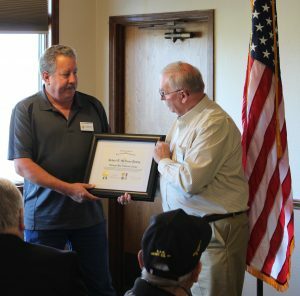 David Stockton (right) presented Certificate and Medal by Veterans recognition awards chairman (left).